This woodblock print was produced from an original painting on silk dating from the late 1920s whose current location is unknown. The indentification of this design as number 28 is original to Rakusan who published the print as the 28th design in his series of one hundred woodblock prints called 楽山花鳥畫譜, Rakuzan Kachou Gafu, lit. 'Rakusan's Flower and Bird Print Series'. Initial edition I publication of 28 was in June 1930 (or perhaps slightly later) in installment fourteen (of fifty). The copy illustrated here is typical of edition I. No later edition reprintings of 28 are currently known. 28 is unusual for Rakusan designs in showing snow not only falling and on the vegetation, but also as a snowbank on the ground. 28alt, a woodblock print of an alternate sketch of the same design subject was issued the month before the initial printing of 28 as a preview advertisement (see Related Designs below). Japanese Green Alder, Alnus firma, 夜叉五倍子, やしゃぶし, ヤシャブシ, yashabushi, is a common deciduous tree native to Japan. In 28 Rakusan shows the tree having lost nearly all of its leaves. The dark oval shapes attached to the branches are the old cones from the preceding year, and the light green, striped, smaller ovals are the new cones for the coming year. The small, light green triangles are the apical leaf buds for the next season. Not mentioned in the title-caption are two large sprays of bamboo of an unidentified medium-size variety. The few remaining leaves are frost-crisped around the edges but remain green in the interior of the larger leaves. Also not mentioned in the title-caption is a leafless, thin-stemmed vine with small, dark, bluish fruit which is twining through the alder branches. Elsewhere in this series Rakusan has named a similar plant as Japanese Ivy (Japanese Creeper, Boston Ivy, Grape Ivy), Parthenocissus tricuspidata, 蔦, つた, ツタ, tsuta; and that is the tentative identification made here. Although, there are other possibilities, Rakusan tended to repeat use of the same varieties of plants, as is suggested he has done here. Japanese (or Lesser) Sparrowhawk, Accipiter gularis, 雀鷂, 雀鷹, つみ, ツミ, tsumi, is one of two species of sparrowhawk native to Japan. (The other is Eurasian Sparrowhawk, Accipiter nisus, now usually called 鷂, はいたか, ハイタカ, hai-taka, etc.) Both species show marked sexual dimorphism, and because they are of different sizes, the males and females each take a somewhat different assortment of prey. Since both species were historically popular in falconry, the males and females of each species have different Japanese names. This multiplicity of names can lead to some popular confusion as to species, especially since falconry is no longer widely known or practiced. 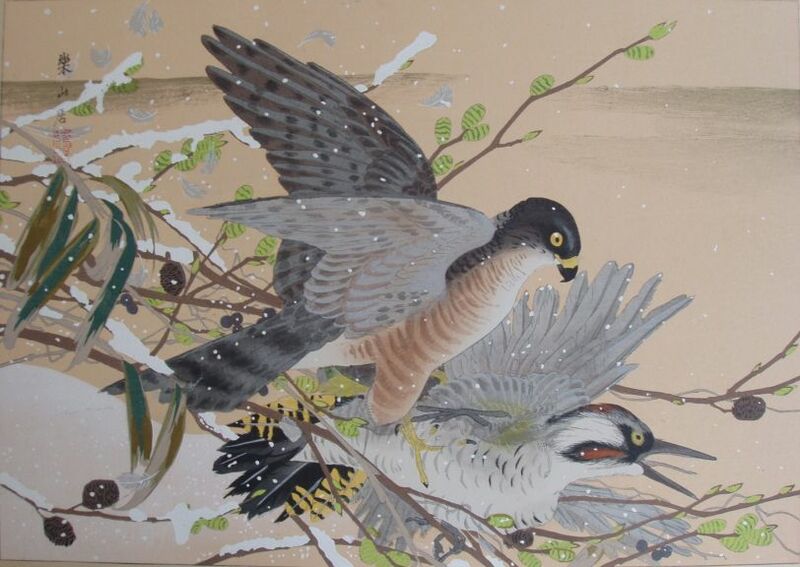 Rakusan created two different sparrowhawk designs; but instead of illustrating each of the two species, he instead chose each of the two sexes of the Japanese Sparrowhawk. 28 shows the smaller brighter male, and 9 shows the larger but less colorful female of the same species. (See link below.) The little male sparrowhawk shown in 28 is also called 悦哉, えっさい, エッサイ, essai. In the title-caption for 28 Rakusan called the bird 小鷹, こたか, コタカ, ko-taka, lit. 'small-hawk/falcon', which is a general name for several small raptors sometimes used in falconry. Japanese Green Woodpecker, Picus awokera, 青啄木(鳥), あおげら, アオゲラ, ao-gera, lit. 'green-woodpecker', is a common Japanese endemic species. The scientific name is derived from an older spelling of the same Japanese name. Although Rakusan does not include the woodpecker in the title-caption for 28, the young male being taken by the hawk is the same species used in other designs in this same series. In addition to the falling snow, Rakusan has also shown a suspended flurry of downy breast feathers from the woodpecker which were knocked off by the force of the hawk's strike. In each of 22 and 22alt Rakusan shows a single bird with characteristics intermediate between a typical male and female, but the bird is probably intended to be male.